Marketers talk about products, but the majority of what we consume are services. I have an 80/20 theory of my own. 80% of what I believe consumers want is quality, service and something familiar and 20% surprise and delight in the form of a good experience (and value depending on the service (or product), and the consumer). I’m going to challenge this, and go as far as saying that it’s more like 80% experience! Because we expect to receive something that works and is of good quality (unless we bought it at the $2 shop)!! Going out to the Brisbane Jazz Club on Saturday night was full of expectations. Probably because I had wanted to frequent ever since I moved back to Brisbane ten years ago. We even had their business as a ‘real world’ client for my QUT IMC students in 2011. I knew they had been damaged in the 72 floods and again last year and patronage was down. While there were some disappointing aspects on the augmented service delivered, overall we had a very enjoyable night. The jazz was smooth (although the talented duo Yemanga played a diverse mix of music), the crowd eclectic, the wine choice quite good (however there were no red wine glasses), the bar staff friendly even with a sold out house. And although my friend’s steak did spoil on its way over from The Storey Bridge Hotel kitchen, we had food! My lamb was pretty tasty, but our cheese platter got lost in the excitement of it all. It’s great to see a not for profit organization turning 40! And we can’t wait to return on April 15 for their 40th birthday celebrations. Surprise and delight needs to be at every aspect of products and service delivery. From lining up at the door on arrival, to being seated, the vibe of the crowd (which is uncontrollable), the staff and the venue. 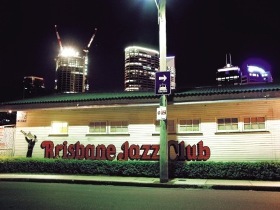 I hope the Brisbane Jazz Club lives on for many years to come.